The Atlas beetle (Chalcosoma atlas) belongs to the family ‘Scarabaeidae’. The Atlas beetle is found in southern Asia, particularly Malaysia. It is remarkable for its size which can be between 25 and 145 millimetres. Like many insect species, the male is larger than the female and usually two males will fight for dominance, the winner permitted to mate with the female in question. 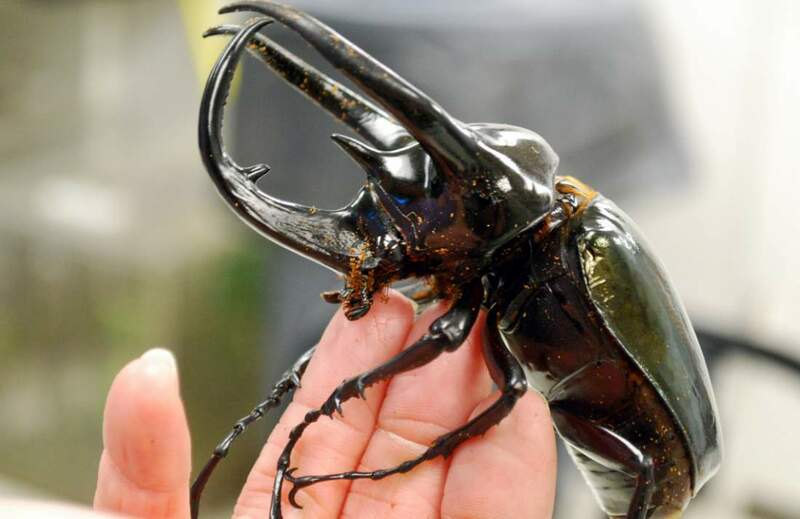 The Atlas beetle is, like other beetles of the genus Chalcosoma, notable for its size and its horns that are located on its head. It is a very strong beetle and can carry 4 grams in weight. The Atlas beetle differs from other Chalcosoma species as its cephalic (relating to the head) horn is much broader. One fascinating fact about the Atlas beetle is that its larvae is known for its fierce behaviour. The larvae is capable of biting, even if only touched. It is also known that larvae that live together will fight to the death if there is not enough space or food. The name of the Atlas beetle may have originated from the ‘Atlas Mountains’.